Prestige present the new 520 S, hard top coupe version of its 520 series. As usual for Prestige S-Line range and designer Garroni, the French builder takes away the flybridge and presents a model with a sportier silhouette. 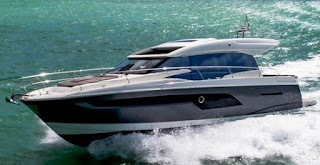 For the remaining the 520 S is identical to the Flybridge, and offers solutions which have been appreciated not little by the Prestige clientele. One of these appreciated details in the Prestige line up, which has shown since some years now upwards of the 450 model is the separate entrance to the full beam midships owners stateroom. Still the Prestige 520S has other couple of options for the new buyer. From the choice of a single berth crew cabin or a tender garage, and that for a chaise lounge style settee or an L-shaped dinette for the aft deck. The Prestige 520 S is powered by twin Volvo 435hp with IPS pod propulsion which give a max speed of 27 knots and a cruise of 23.